Reading below your age level is often frowned upon, but it shouldn’t be. Children’s and young adult fiction novels can be some of the most thought-provoking series out there. 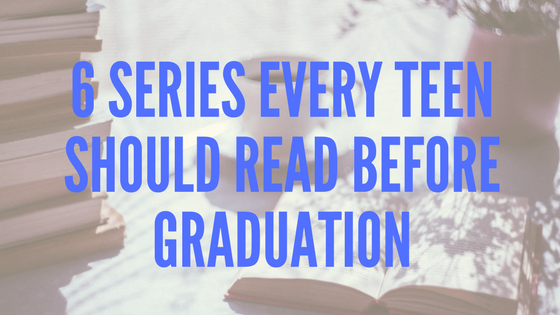 I’ve come up with 6 series I think each teen should read before they graduate high school. The series are meant for kids and will be listed by reading level, but that should not discourage older or younger students from giving them a go. Shel Silverstein is a master of poetry. Crafting unusual stories and pairing them with hilarious drawings, Silverstein intrigues people both young and old. While his books aren’t a series in the traditional sense, you could definitely treat them as such. Teens won’t consider these books page-turners, but they are good for a rainy afternoon when paired with a cup of tea. The Little House books have been popular for generations, and for good reason. They show the hardships and triumphs of pioneer life in a way that no other series was able to. And beyond the original series comes the Days of Laura Ingalls Wilder series. As an extension of the original, my take on Laura’s life covers many difficult topics in an approachable way. These are all quick reads and could easily take a month to finish. The Chronicles of Narnia is an adventure series written for kids, but packed full of good lessons. Although The Lion, The Witch, and the Wardrobe is the most popular book (and movie), the entire series features varied combinations of kids and fantastical creatures. The best part is that each book has a different tone, which seems to change based on the characters presented. These books can seem juvenile at first, but the story picks up quickly, and by the end of the series, you’ll wish you had more. With a recent Netflix adaptation, it’s necessary to read Lemony Snicket’s masterpiece about the three Baudelaire orphans outsmarting a troupe of villains eager for their family fortune. Violet, the oldest and an inventor, is a great role model for girls who want to enter STEM fields. Klaus is a voracious reader, and may inspire more boys to read. Sunny is just an adorable baby who loves to bite things. Despite the dark tone of the books, it contains a ton of humor, usually at the expense of the children. Although the ending is not happy (as Lemony Snicket says in Book 1), you will enjoy the ride so much that it won’t even matter. One of the best new series out there is the Michael Vey series. A group of teens with extraordinary powers finds themselves fighting the powerful force that gave them their abilities. There is romance, friendship, betrayal, and human experimentation. The books seem kid-friendly at first, but some scenes (particularly in later books) discuss gruesome realities, which can appeal to older teens who have the ability to face these scenes head-on. There are tons of great books out there, but sometimes it’s nice to read something that can sweep you up into the story, rather than challenge you. The reason teens should read these series is not only because they are good stories, but also because it gives them a break in a stressful world. Many teens think of reading as a chore; let’s reinvigorate this past-time with the next generation.